I'm making my second batch of chili of the season and I am looking for recipe suggestions and tips. Everyone seems to have a variation on the dish and their own little tricks and secret ingredients. Edited by Jason L, 13 October 2013 - 2131 PM. Rocky has shared his chili recipe here before. It looked awesome. Dammit. Now I want a bowl of chili. You're making me spend money and gain weight! Thomas you ever come my way we can go grab some great chili at a little chili parlor here in town, complete with chrome stools at the counter. Jason, thanks for sharing that. I wonder if that is the same Shelby of Shelby Cobra fame. Edited by Mr King, 14 October 2013 - 0046 AM. Jason, thanks for sharing that. I wonder if that is the same Shelby of Shelby Cobra fame. When isn't it chili season? In the Midwest football season is chili season. I'll remember that Mr King, thanks! Since the topic post was posted, I've been consuming chili dishes since yesterday. Yesterday night, I had a bowl of chili con carne (with no beans). Damn it was good. The chili was really powerful. I didn't finish it all and had the leftovers for breakfast today. Before lunch today, I had a bowl of chili with chunky beef and beans. Not as good as last night's chili though, the flavor was mild, and the dish was too soupy. And then a few hours ago for afternoon snack, I had nachos and chili from a can (Hormel I think). I've been farting like mad since this morning. Edited by TomasCTT, 15 October 2013 - 0550 AM. Here's one I use, it's from an Oklahoma territory recipe I found in an old cook book. Heat the oil in a 6 quart dutch oven and cook the onions in it until soft, add garlic and cook till fragrant. Add meat and brown it, add tomato paste and cook till everything is coated and it starts to brown. Mix enough water with the chili powder and flour until it forms a thin batter and add to the pan. Add all the tomatoes (don't drain) the tomato juice and oregano. Salt and pepper to taste. Cook over low heat till the meat is tender or move the pan to a pre-heated 225 degree oven for a couple hours. I like to serve it with skillet cornbread or over rice. Edited by Harold Jones, 15 October 2013 - 1126 AM. Made my first attempt at Coney Island chili dog sauce for hot dogs today. I am really impressed with it. I cheated and used two packets of Gold Star Cincinnati style chili seasoning instead of doing my own individual spices. It was a good call actually as it is a really good spice mix for this. Of course I did add in my own additional ingredients that I felt the dish called for. It is incredibly greasy, but that is how chili is served around here. 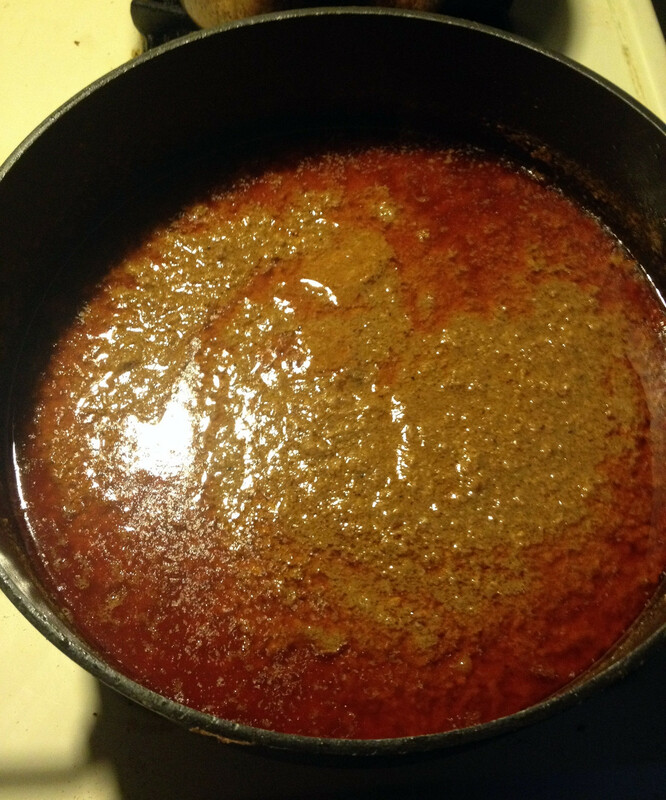 Traditionally they have beef suet added to them, and I added some to this chili along with using a high fat ratio ground beef. This chili would make excellent chili mac. Pardon the dirty stove and poor lighting. I had been cooking all day, and the combination of a crappy Iphone camera and phosphorescent lighting does not help. ^ I nearly ate my monitor. Looks good. I mde some the other day as well, even the kids liked it. My wife made a pork chili last night, too late to have more than a few spoonful. Simmering away right now. You garnish with lime zest (and a bit if juice) and fresh cilantro. Smells freaking delicious. We do a half dozen different types every winter. The only chili I cook is the recipe that Murph^ posted here several years ago. When my friends hear that I'm making it, they invite themselves to dinner. 1. Whisk all of the chili powder into a pan containing one of the 26 oz. containers of beef stock. Bring to a boil, reduce heat and simmer for 30 minutes. 2. Heat oil in a 5 to 6 quart pan over medium high heat. Add half of the meat at a time and cook, stirring as needed, until well browned. Lift out meat and set aside. Leave any liquids still inside pan. Reduce heat to medium; add onions and garlic to pan and cook, stirring, until onions are soft (about 10 minutes). 3. Whisk all of the masa into a pan containing the remaining 26 oz. container of beef stock and the Merlot. Bring to a boil reduce heat and simmer for 5 minutes, whisking occasionally. 4. Return meat to the pan containing the sautéed onions and garlic. Add the paprika, salt, oregano, cumin, cayenne, yellow wax and jalapeño pepper slices. Add the beefstock-chili powder mixture and the beefstock-wine-masa mixture and stir. 5. Bring to a boil over high heat; reduce heat, cover and simmer for two hours minimum. Spoon off any grease rising to the top. After it has simmered for 90 minutes, stir in the can of crushed or diced tomatoes. Add crushed red pepper seeds (to taste, as often as you like) during the two-hour simmering period. OPTIONAL – 30 minutes prior to serving, stir in 2 cans of chili beans (not recommended for Chili Competitions). 1. Rinse ancho chiles and discard stems; break chiles into pieces and place in 1 to 2 quart pan with water. Bring to a boil over high heat; reduce heat, cover and simmer until chiles are soft (about 30 minutes). Whirl chiles and their liquid in a blender or food processor until smooth; set aside. 2. Heat oil in a 5 to 6 quart pan over medium high heat. Add half of the meat at a time and cook, stirring as needed, until well browned. Lift out meat and set aside. Leave any liquids still inside pan. Reduce heat to medium; add onions and garlic to pan and cook, stirring, until onions are soft (about 10 minutes). Return meat to the pan and add the paprika, salt, oregano, cumin, cayenne, yellow wax and jalapeño pepper slices, beef broth, and ancho chile purée. 3. Bring to a boil over high heat; reduce heat, cover and simmer until meat is tender when pierced (about 2 hours). After it has simmered for 90 minutes, add the can of crushed or diced tomatoes. 4. Stir masa mixture into chili. Cook, uncovered, stirring occasionally until mixture thickens (about 15 minutes). 5. Serve in bowls topped with chopped yellow onions and shredded cheddar cheese. Have hot flour tortillas (or cornbread), salsa and tortilla chips available when you sit down to eat this wonderful chili. Olé! A. Buy and use two large containers of Beef Stock (not broth, STOCK). Each should contain about three cups of broth. Substitute the broth for water in the original recipe. B. Use coarse ground chili meat instead of beef cut into cubes. After you lift out the browned beef (and place in a large bowl) , sautee your onions and garlic in the meat juices. After they are sautéed, lift them out (and place them in a large bowl). Get rid of the remaining meat juices before returning the meat and onions to the pot. C. Double or even triple the amount of masa used for thicker chili. C. If you cannot find the hot yellow peppers in the produce section of your grocery, you will find them on the aisle where the pickles etc. are placed. D. In Step 1, above, boil and simmer the ancho chilis in one of the containers of stock (instead of water) as per directions. E. After completing Step 2, above and before beginning Step 3, above, empty the second container of stock and whisk in the masa until it is smooth and there are no lumps. Stir this mixture into the pot and then begin Step 3, above. F. Delete Step 4, above. G. OPTIONAL – 30 minutes prior to serving, stir in 2 cans of chili beans. You wanna risk having them revoke your Texas passport over that? Doesn't the Republicstate of Texas maintain some kind of database for offenses such as that? That's why it says "optional."